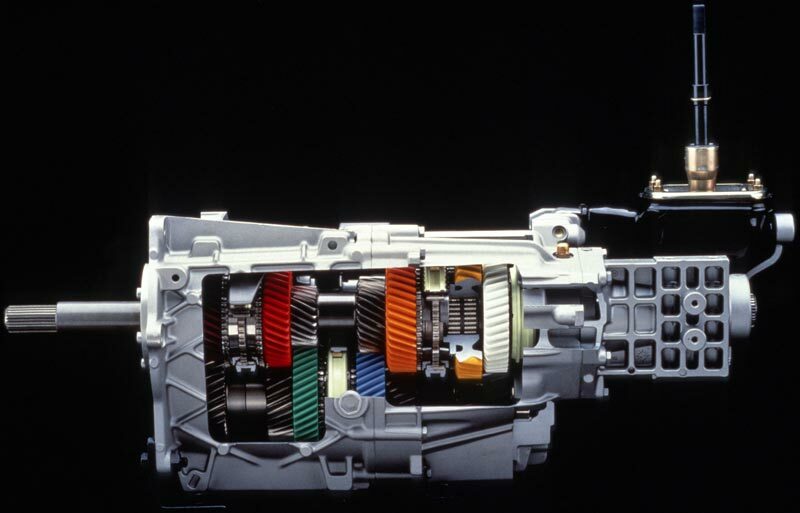 The big news for 1989 was the completely new six speed manual transmission. It was designed for the Corvette by Zahradfabrik Firedshafen A.G. (ZF) a German transmission builder with an excellent background for producing bulletproof transmissions for high horsepower applications. 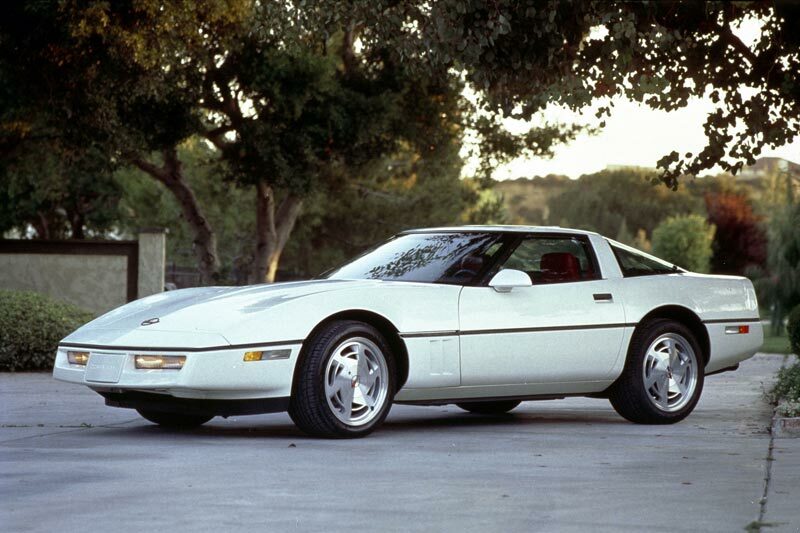 It replaced the "4+3" manual plus overdrive Doug Nash unit that first appeared in 1984 Corvettes. It was a no-cost option (the four speed automatic was standard) with improved shifting characteristics as part of the bargain. 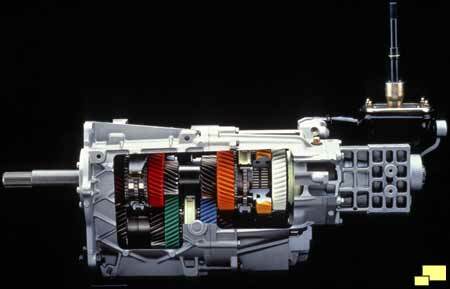 Similar in some ways to the overdrive function of the "4+3" manual, the new transmission featured a Computer Aided Gear Selection (CAGS) system. Under certain circumstances (engine warmed up, less than 35% throttle) shifting up from first caused fourth gear to be selected. Any other circumstances (in other words, spirited driving) caused the transmission to behave like a conventional six speed. The goal was improved fuel economy and the system resulted in an EPA rating of 16 mpg city / 25 mpg highway rating - and once again the Corvette was not subjected to the gas guzzler tax. Also new (and overshadowed by the introduction of the six speed) for 1989 was the Selective Ride System (RPO FX3; $1,695.00). It required the Performance Handling Package (RPO Z51; $575.00) which was was available only with manual transmission coupes so the price added up. It started a new trend in Corvettes: giving the driver the ability to control suspension settings. Three settings were available - Tour, Sport and Performance - controlled by a rotary switch just behind the shifter. Within each mode there were six different settings which varied depending on the speed. The settings were implemented via actuators located in the shock absorbers. 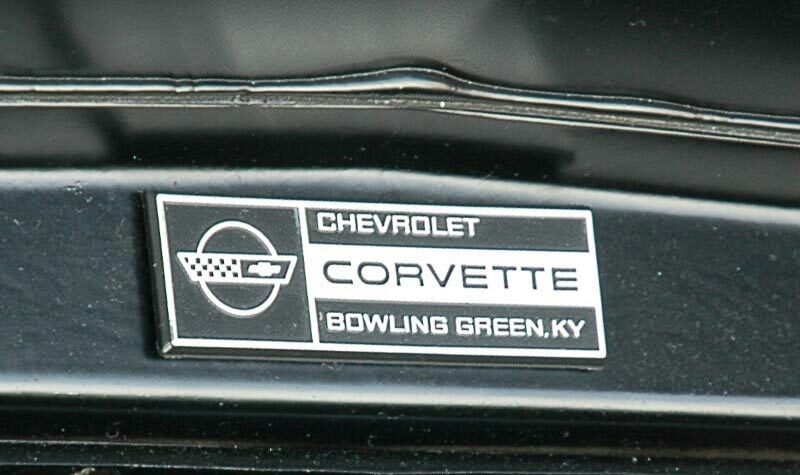 All C4 Corvettes proudly featured a Bowling Green KY assembly plant emblem under the hood. 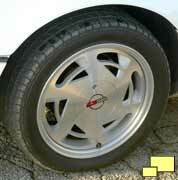 Right: The 17 inch wheels optional for 1988 were promoted to standard equipment in 1989. 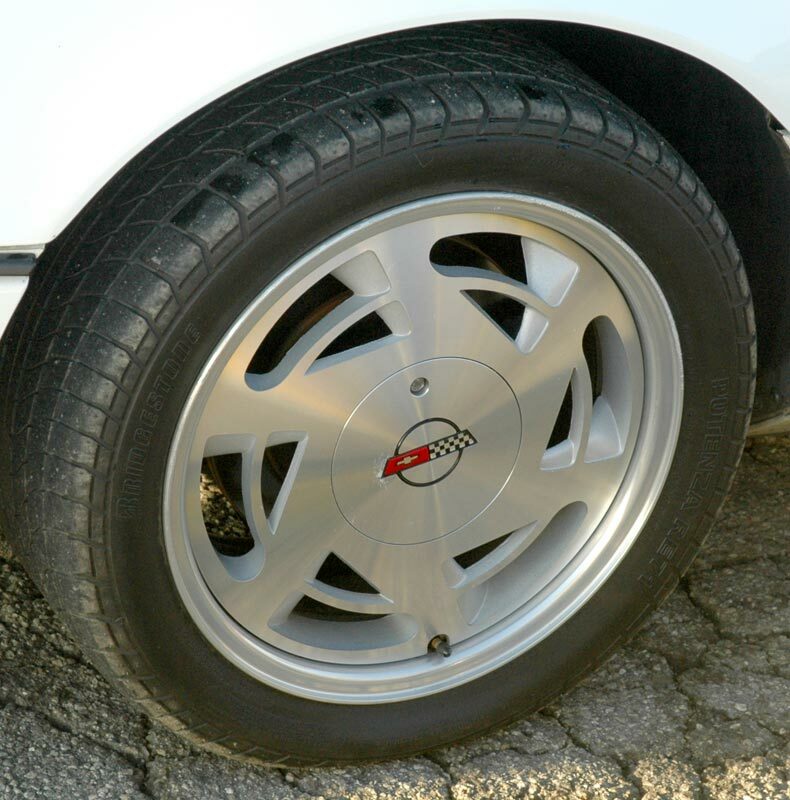 The 1989 Corvette continued its mission as a showcase for GM technologies with the optional Low-Tire Pressure Warning Indicator (RPO UJ6; $325.00). This ingenious system consisted of a tire pressure sensor mounted inside the wheel which, via a built in self-powered radio transmitter, relayed tire pressure data to a receiver in the dashboard. On the other side of the wheel was a weight equal to the transmitter assembly so wheel balance was maintained. A dashboard mounted light warned the driver when tire pressure was low. A factory sourced hardtop (RPO CC2; $1,995.00) became available in 1989 and there was a lot to back up the high price. Construction consisted of a composite panel of rigid urethane surrounded by fiberglass which was molded around a structurally sound steel and aluminum cage. A cloth headliner and a heated rear window was included. 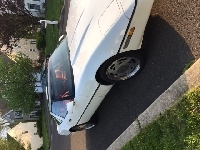 Note: photo is a 1990 Corvette. 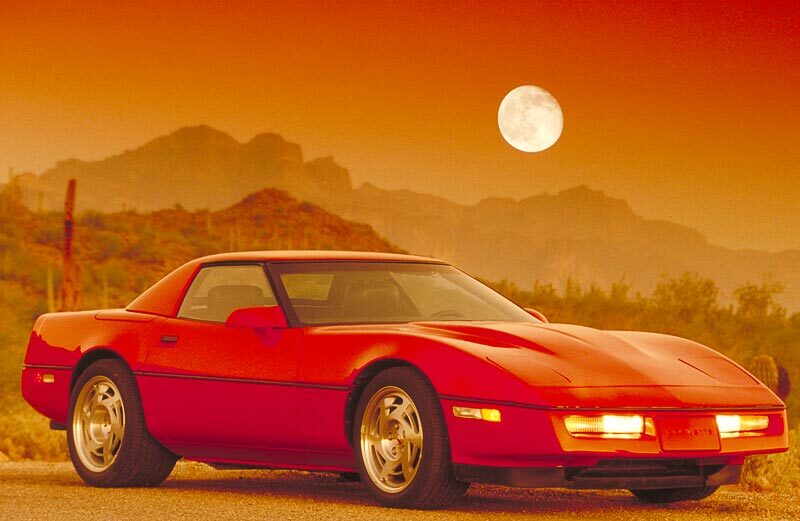 1989 Corvette: Official GM Photo. Notes: Base Corvette Coupe with 350 cu. in. 245 hp engine and four speed automatic transmission: $31,545.00. Base Corvette Convertible with 350 cu. in. 240 hp engine and four speed automatic transmission: $36,785.00. Notes: Not all soft top / interior combinations were available. Sorry, but ZF stands for Zahnradfabrik (gear factory) Friedrichshafen (a city) and not Zahradfabrik Firedshafen. My eyes are bleeding now.